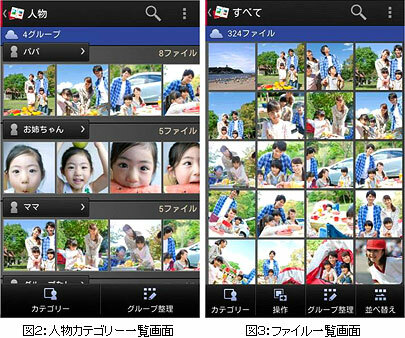 NTT DoCoMo will start from September 20 storage services “photo collection” of photos, videos. Free (sp-mode contract required), user fees capacity that can store up to 5GB. We offer a “photo collection” is initiated, the storage service which is positioned in one of the line-up of cloud services, “DoCoMo cloud” of DoCoMo. In addition you can save on the cloud photos and videos from your computer or smartphone, you’ll be able to access from such as smartphones and tablets other, also provides the ability to organize automatically be done in the cloud processing to determine the scene and face are. DoCoMo’s smartphones and summer of 2012 and later model, the corresponding device, Windows PC. Some models also support that made the upgrade to Android 4.0. Detailed compatible models are available on the information page of the company’s services. Can be stored in the cloud, such as photos taken automatically when you install the app on your smartphone, set in advance. (10MB Max from smartphone tablet), photo video (up to 30MB from smartphones and tablets) has become a maximum 100MB per file up to 30MB per file. Video and photos are stored, can be set to be sent to the “Photo Panel hearing.” Can be automatically grouped by various criteria, such as “Service” model “Location”, “event”, “person”, “date”. It is also available in conjunction with third-party services, such as, “Evernote” “Eye-Fi” “high cam” also, and stored in the “photo collection” and photos of each service.